Do you offer annual payments? Yes! We offer the ability to pay in advance for DeployBot by adding a balance to your account. Buy 12 months in advance and we'll add the 13th month for free, just email us (support@deploybot.com) once you've added your credits to take advantage of this offer. To pay in advance, login to your DeployBot account as the account owner. Click on the " Account option in the top right, and then select Plans & Billings. On the Plans & Billing page there will be an option on the right that mentions Pay in advance where you should click on the Make a one-time payment hyperlink. You'll then have the ability to add a balance to your account. After you click the Make Payment button we will charge the card on file. The amount will then be added to your account balance. To change your card of file check out our help doc on the topic. On your next billing date, we will withdraw the amount from your account balance instead of your credit card. Your invoice will reflect this information both in the email and in the invoice in your account. In the past invoices section, you can see if you made a payment from your credit card or account balance. You can also view invoices for advance payments. 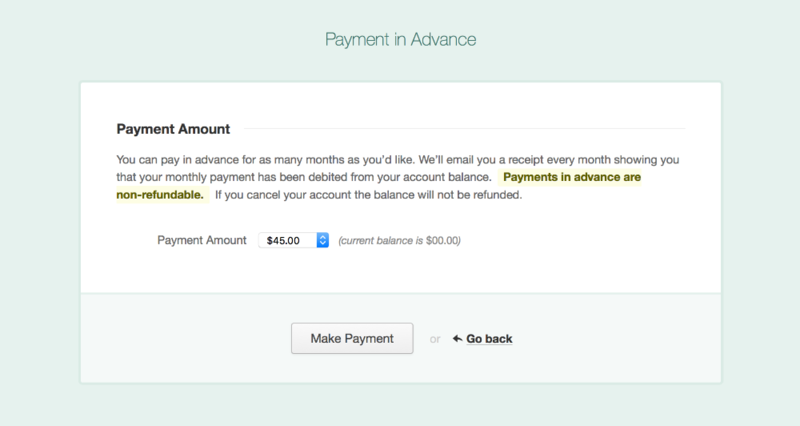 Payments made in advance are non-refundable. If you cancel your account the balance will not be refunded. Please note: If you don't have enough credits in your current account balance, we will charge your credit card for the difference. Only account owners can add an account balance. Credits purchased in advance are non-refundable. We recommend testing to confirm that DeployBot will meet all of your Deployment needs before purchasing credits in advance.